The ocean was breathing. Its rhythmic rise and fall accentuated by the sound of the waves pushing against the bow of the Sea Lion. It occurred to Glendin, as she leaned over the starboard railing near the bow, that this notion was her own. She had not heard it spoken among her kinsmen, not even by her own father, whose knowledge of the sea was arguably the most thorough in all of Osan. Though it was her own realization, Glendin was sure it was true, and she wondered why none of the others had recognized it yet. By the life cycle of her kind, Glendin was still a child despite having seen two hundred summers come and go. She would need to see one hundred more before she became an adult. Because of her young age, she had not yet developed the ability to breathe under water for brief periods, as was characteristic of the Osan Eldinn. Her lungs were not fully matured and would not accept the liquid. Because of this, her mother Mala protested every time her father took her fishing, but Pyon always won the argument by pointing out that he had been born on a boat and he had not drowned. Glendin could swim and was his daughter as well as Mala’s. The ability would come in time. Mala, who had been born in the forests of Eloglenn and was far more comfortable in the trees than on the sea, would throw her hands into the air and yield, despite declaring her intention to feed her husband to the sharks if any harm came to their eldest. But despite her mother’s misgivings about Glendin’s presence on the boat, there was nothing Glendin loved more than being at sea, and there was nothing her father wanted more than to take her with him. So more often than not, when Pyon and his crew set sail to fish the waters of the bay and beyond, Glendin was leaning over the bow railing, her face in the wind as it tossed that shock of black curled hair behind her, just as it was now. The sea was calm and the waves small. The mid-afternoon sun baked her olive-brown skin, but since they were sailing to their final spot, the apparent wind delicately balanced the temperature on deck. She felt both warm and cool. Barefooted, she wore a short blue dress bound at the waist with a belt and tan leggings that stretched down to mid-calf. A sheathed filet knife hung from her belt. It had been a good day. The crew had brought in a decent haul at each fishing spot, and Kel and Kal, the twins from the east side of their village, had speared five large Ondöwan Bass – large meaning they were in length, each half of Glendin’s height. The overall mood of the crew was jovial, and Glendin was happily lost in the salted wind, the warm sunshine, and the breath of the waves. Land was far out of sight, and the Sea Lion bore down rapidly on the eastern current. There, the water was cold, the fish were huge, and Pyon would have little work in navigating them home, as the current itself would carry the boat back within eye-sight of the Bay of Osan, on what was the final day of the Sea Lion‘s early summer run. Changes in seasons brought changes to the current, and with each change, Pyon altered his excursions accordingly. Though the day could already be deemed successful, Kel and Kal were hoping to spear enough large fish that they could stay ashore for a week with no repercussions. Pyon stood tall and alert at the helm. His sharp eyes scanned the horizon and the sky. Glendin knew he was analyzing more than their position and speed, even more than wind speed and direction. He was also monitoring the waves, clouds, and temperature of the air. When they had set sail that morning, the sky was red. Pyon was watching for a storm. Glendin drummed her fingertips on the railing and sang their song into the wind, so it was almost lost before the notes and words escaped her lips. But a red sky at night is the sailor’s delight. And dry grass at light, brings the rains before night. Don’t sail where gulls walk, despite the fell flood. Be the winds gale or doldrums, you’ll stick in the mud. Glendin watched too. She was not as good as her father at reading signs the ocean sent, but she was learning and knew that one day she would be. Running with the wind, they crossed the two leagues to the current in a little over an hour. Relaxing the sails, Pyon remained at the helm to guide their drift, and to tack when needed, while the crew prepared to fish. Fishing the current was more suited to Kel and Kal’s style as the fish tended to be larger, making the casting nets, in most cases, worthless. The twins sharpened their tridents, and the others readied their gaffs and landing nets. While tridents were far more effective, Glendin thought it was always worth a toss, just in case, especially if she was not needed landing the speared fish. She strode across the deck to one of the storage lockers, removed her net, and took her favorite position on the starboard side of the bow, far enough from Kel, who took his position on the bowsprit, to be out of his way and to give him first pass at any fish. He perched overtop the figurehead. It was a green and blue sea serpent with fins and whiskers, carved from a lightweight wood, and painted, a likeness of the Kelanaga. Its mouth yawned open in unsettling menace, revealing rows of shark-like teeth. Mala had crafted it at Pyon’s request before Glendin was born. Every time it needed new paint, Pyon would suggest, “The Kelanaga is powerful but not malevolent, you know. You could make her look a bit less savage.” But Mala never complied, so the figurehead remained fearsome. Kel settled in and, from Glendin’s vantage point, appeared to be riding the Kelanaga. He cast Glendin a sideward grin. She smiled back. Kal fished off the stern. The heaving of the seas grew as the waves began to stand higher. Pyon checked the clouds and the horizons. Wind speed and direction, indicated by a small streamer attached to the main mast, remained the same. As they drifted around in the current, a cry signaled spotting of a school of bass, Pyon tacked to keep them over it, and the twins released their tridents. A chorus of voices, elated shouts, and barked orders erupted the moment the twins commenced. The crew scrambled to haul in the fish, remove them from the spears, and stash them away. Amid the cacophony, Glendin gathered her net, taking the middle with her right hand, using her left to transfer an edge to hold in her mouth until she could untangle the lead line. With the net finally in position, she let the edge fall from her mouth. Turning back from her waist and keeping her shoulders square with her hips, she whipped her torso forward and released both hands. The net unfurled to form a sagging circle, struck the water, and sunk, holding shape, a fast form of floating like the seeds of a dandelion. Glendin caught the handline but let it slide through her grip unobstructed as the net sank in the waves. At the end of the line, her hand tightened, swiftly jerking the net closed beneath the water. She began hauling it in, hand over hand racing her catch for the first few pulls. She drew the net, dripping, over the railing. The contents, though diverse, were worthless – a tiny Spot, a smaller Drum, a giant Puffer Fish who had already inflated, and a long piece of seaweed. She dropped them each back over the side, except the Puffer, whom she left in the net on account of its spines. 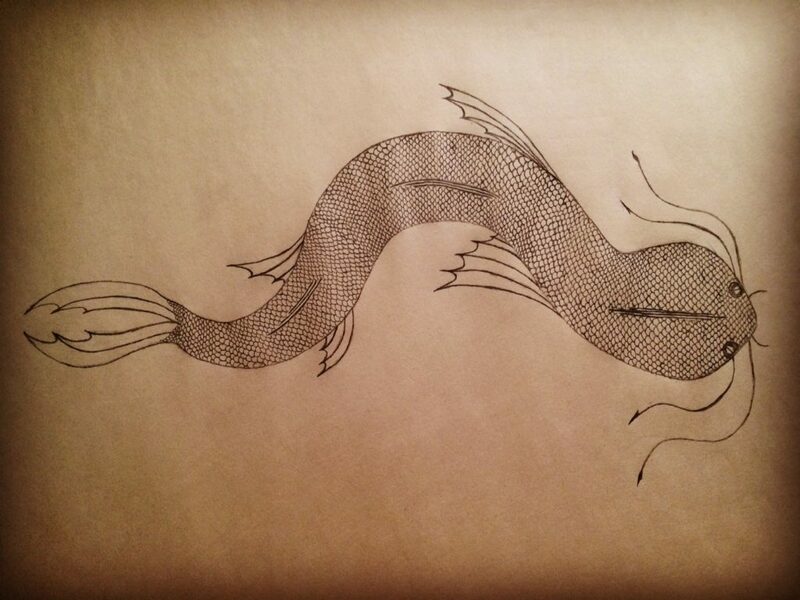 She tossed the net, loosed, over the side, so it could swim away. The next two casts yielded nothing at all, and she wondered if perhaps she should just give up and assist with Kel and Kal’s catch. But no one had yet requested her hands, so after a quick glance around, she returned her attention to the waves and her net. The cast was beautiful, the net unfurling uniformly, a perfect circle, sinking into the deep as such. The net dropped quickly, and as the end of the line came, Glendin snatched it back and hauled it in. The first couple pulls proved smooth and easy, but the third encountered sharp resistance. Almost immediately, the net was heavier, as if it had somehow snagged a stone after it closed. Glendin pulled, fighting the net each time her arm drew back. She felt it quivering beneath the surface, as if she was fishing with a line. Preoccupied helping the twins, the others did not notice the struggle. Neither did Pyon, who was focused on the rising waves and clouds gathering west-by-northwest. Sweat rolled down the small of Glendin’s back, and the handline tore the skin of her palms. At last the net broke the surface, inverted, jerking and quivering, cutting the tops of the waves and churning up foam, but try as she might, Glendin could not haul up the net. In a final effort, she tightened her grip and sat down on the deck, her weight drawing the net up nearly rail height. She searched for a cleat to tie off, but the nearest loomed a few paces away. She decided to tie off on the railing, but curiosity got the better of her, and she stole a glance down at the net at the expense of her bleeding hands. She could not recognize what was netted. It was spherical, its surface bore a strange luster so that she could not recognize the material from which it was made, and it was made, not grown, of that she was sure. Attached to the ball-shaped object was a line, which passed out the mouth of the net and was somehow wrapped around the neck of a grey seal. The creature fought against the tether, and blood swirled in the water. Horrified, Glendin dropped the handline, and the net splashed down into the waves. Glendin jumped to her feet as the seal darted from the boat. Towing its tether and the net, it swam near the surface, unsteadily. “Wait!” Glendin cried. “Wait! I’ll help you!” She wished she knew Ocean Speak, the language of the natural world, but she had never had the skill. She knew the creature could not understand her using the common tongue, but she called to it anyway. Thinking of the creature and the blood, her chest hurt, her throat tightened, and she wanted to cry. While she had not wrapped the strange things around the seal’s neck herself, she had hurt it badly. Relief was only found when she leapt over the railing out onto the waves, sprinting crest to crest in pursuit. Though hampered and injured, the seal was fast and had a head start. Glendin hoped she would catch it quickly. As she leapt wave to wave, she wondered how she would ever be able to help the creature. It was terrified and running, and she would not be able to communicate that she meant no harm. Stupid language! She called out a few words she thought would declare her intent to help and her friendliness, but when the seal swam faster, she abandoned use of the old tongue. She had no notion clear of what she said anyway, so she reverted to her every day language. But again, the seal shot away, swimming northwest, ever faster. Abruptly, the seal’s pace slowed. The seal stopped and bobbed in the water, rather awkwardly because of its tether. The strange sphere also remained atop the water a couple paces away, to Glendin’s surprise. She stopped before the creature, stood a moment, then sunk into the water, though not with the graceful, slow form of her father. It was more of a plopping. She began treading water, and the seal wiggled closer to her. Blood oozed from large welts on its neck. Its wide, dark eyes met Glendin’s, and her emotions welled. Slowly, she touched the cord material that wrapped around the seal’s neck. It was smooth and unyielding. Glendin still could not tell what it was. She worked her fingers under the material with care. In a few moments, it loosened. The ball-like object was surprisingly light, creating little resistance, and appeared to be made of material similar to the cord. Once she had loosened the tether several finger widths, she removed the knife from her belt and sawed at it until it finally popped free. The seal inhaled the deepest breathing Glendin has ever heard. It exhaled – a rush of air and life, as is nostrils flared many times larger than appeared possible. 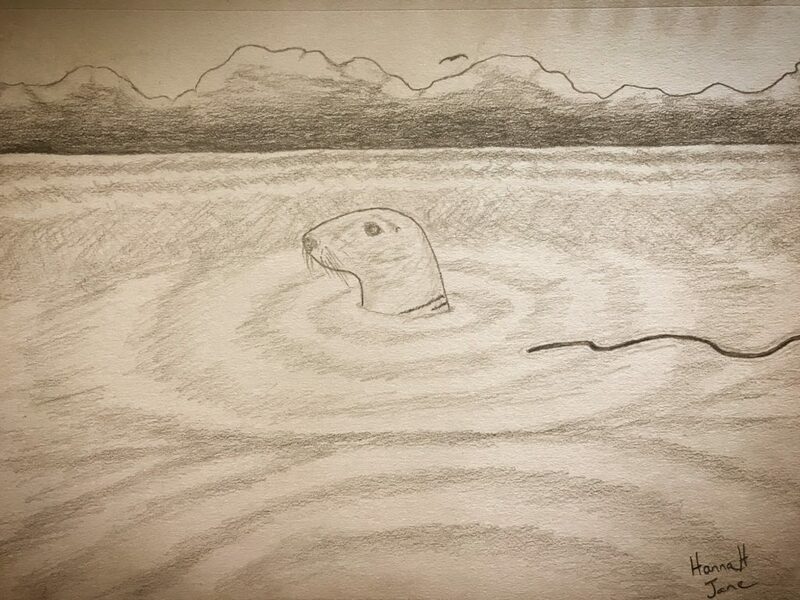 The seal continued breathing rhythmically, making no other sound, but abruptly, Glendin found in her mind an image of the eastern side of the Bay of Osan and a strange arrangement of objects like that which had snagged the seal. The arrangement, all under water, resembled a forest of trees bearing perfectly round, colorful crowns, and though the image was clear and vivid she was certain she had never seen it before. The seal chattered to her. Fortunately, its wounds did not bleed as profusely now that the material was not cutting into its silver skin. The waves rose sharply. Glendin looked to the sky and found dark, heavy clouds rolling toward them from the west. “I have to get back.” She touched a flipper in a soft farewell, and the seal bumped her hand, blowing air through its nose. Glendin kicked hard, and her body lifted out of the water, almost high enough for her to step on a wave. She sunk back down treading water, took a moment to gather strength, and tried again. Again, she missed and fell back into the sea. She took a little longer and tried a third time. Again, she was unsuccessful. Glendin looked about, riding the building waves, bobbing up and down like the seal. She realized with sudden terror that the Sea Lion was a mere speck on the eastern horizon. She was far from the boat, the waves were rising ahead of what was certainly a large storm, and Glendin was stuck in the water, unable to rise to the crests and run back to the boat, safety, and her father. Her heart quickened. The seal still hung on the surface, watching Glendin with gigantic eyes that looked like large blots of quill ink. With a burst of strength, Glendin kicked and rose one time after another in rapid succession. She thrashed at the waves, each time coming so near to breaking free of the ocean’s grasp. But it had her. Her valiant attempts became weaker and weaker until finally her hip bones were barely emerging. Her legs ached from the exertion, her lungs gasped in air, and as the reality of her situation set in, she cried. The seal chattered, and when she turned her attention, it bumped the strange ball toward her with its nose. Glendin seized it, latching on with body and hope and a rush of thankfulness she could not express. She wiped tears from her eyes with her shoulders, but when she turned back, the seal was gone, leaving only ripples that quickly dissipated. “Well, I can’t stay here,” she thought. Not only was the height of the waves increasing, but their interval was decreasing. Turning herself and the ball toward the speck of a boat, she kicked her way toward it. Progress was much slower than she hoped. Actually, she did not seem to be making progress at all. No matter how hard she kicked, the Sea Lion seemed to remain the same distance away. Clouds obscured the sun. When Glendin stopped to rest, she realized the Sea Lion was getting further away, and it occurred to her that while her father’s boat was still in the current sweeping all aboard back to Osan, she was not. She started kicking again, despite the exhaustion and pricking pains that shot without interruption though her legs. The effort paid off only in maintaining the distance between her and the boat, and she began to wonder how long she could keep this up. But the boat stayed its course, and there was no movement, no scurry, no indication she had been missed or heard. She wondered why, but almost immediately the wind pushed against her face, and her father was tacking the boat. She was downwind, and rather than carrying her voice to her father, the gust blasted the sound out into the vast expanse of the Ondöwan Sea. She kept kicking though her screams turned to hopelessness in her throat and nearly strangled her. The wind picked up. At first, it merely battered her face as she crested waves that rolled toward the current. Then the waves begin white-capping, erupting into little rolls at their peaks as their strength built. Throbbing accompanied every movement, but she kept kicking. The wind pushed against the white caps turning them over into backspray. Water smacked Glendin’s face. She sputtered, doing her best to keep it out of her lungs. When the next waves passed, she tried slipping down into the water behind the ball, but the ocean nearly tore it from her grasp. Heaving her chest back onto it, she wrapped her arms around it and clung, gasping. She kicked. The next wave passed. This time, the backspray became a wall of water, and she could not breath. It passed. She sputtered, cried, and kicked. The salt stung her eyes, but she could not let go to wipe the seawater from them. It ran like rivers off her face. She tasted it, and it burned inside her head. The next one came. Just before the water hit, she turned her head toward her right shoulder and her face down toward the ball and the sea. The backspray enveloped her, but the water stayed out of her nose and mouth. Wave after wave passed, and she continued turning her head to keep breathing. She was no closer to the Sea Lion, and though she was still kicking, she could feel herself slowing, despite her will to move faster, as she battled the current and the waves. The thought, between evading backsprays, was sobering, but to drown without a fight seemed wrong, so she kicked – wave after wave, water wall after water wall. The sea would struggle if it were to take her. She would not go quietly. She would battle until her arms lost hold and she sank into the depths and light receded. Glendin feels something push her. The force comes from the ocean beneath, yet she begins moving forward rapidly. Her grip tightens around the ball, and the Sea Lion draws closer with increasing speed. She is now close enough to see commotion on desk. Her father abandons the helm and leaps over the side, jumping crest to crest. His voice calls her as he moves one way then another. Glendin glides so fast a small wake rises behind her. She peers down into the rushing water but can see nothing discernible. Whatever it is stays both behind and beneath her, covered by the churning water. She is no longer kicking. Pyon rushes ever closer. His sharp eyes spot her, and he dashes in her direction. Something hard and cold makes contact with Glendin’s trailing feet. Her knees are bending and forced underneath her like a spring. She is rising from the water. Beneath her, the glitter of turquoise and cobalt scales. She is flying – up, twice as high as the mast of Osan’s largest ships, so high the fishing village and the land beyond are rising on the horizon, and she is hanging in the wind for a mere moment, as the massive scale-covered head under her feet is dropping. Glendin, in decent, is watching her – the Kelanaga – the vast blue-green sea serpent with barbed whiskers, translucent fins, and gleaming amber eyes diving beneath the waves. Glendin is falling into Pyon’s arms, and both are plunging into the sea, the force of her fall pushing them down, resounding like a bass drum. And as he is kicking, out of the water, onto the wave tops, skipping back to the safety of the Sea Lion, the Kelanaga’s body is rising in multiple arches. Back on the safe side of the railing, the crew will watch the creature with mouths agape, and as Pyon turns back to survey the sea, the Kelanaga will raise her head from the water and dip it in their direction, as streams of water cascade off her jowls, fins, and whiskers. She will swim away while the crew, Pyon, and Glendin continue watching the waves long after she is out of sight. The seal will pop up, chatter to them, and disappear into the depths. Pyon will bellow a stream of scolding that lasts until Glendin counts to thirty-five. Then he will hug her tightly, telling her how grateful he is that he did not lose her. Finally, he will pass her in the loving arms of the crew, their hugs, and ruffling of her soaked hair, while he navigates home, running from the storm. She will spend the ride sitting on the main deck, wrapped in a blanket Kel brings her. Pyon will call a Messenger Gull, which will fly to Osan with a hastily scribbled note for Mala, and she will meet the Sea Lion at the docks bearing armloads of flowers. They will journey up the beach to the Look Out, and with their eyes to the setting sun, with the wind whipping and waves rising, they will cast the flowers into the sea, singing a song of thanks to the Kelanaga who sustains the world, the sea, and life. 4 Responses to "The Current"
Excellent. Glad to see you are writing again. Look forward to the next book. Waiting for the next book! Let me know when it is available.